After going to school in Berlin where I lived with my English parents until a few days before the German attack on Poland, I ended up in Switzerland where I saw out the war and spent my last six years of formal education at French-speaking schools and universities. In Nuremberg, the Trial was being conducted in English, French, Russian and German and was using the novel and largely untried system of simultaneous interpretation. Due to the length of the trial, some interpreters were leaving and had to be replaced. Monitors were dispatched to look for new talent. A test was organised at the Geneva University School of Interpreters which, to my surprise, I passed. We had learnt consecutive interpretation only and to find myself speaking into a microphone at the same time that I was listening to a disembodied voice through earphones was thoroughly disconcerting. With the ink of my degree scarcely dry, I set out for Nuremberg. It was my first job and, though I did not know it at the time, also my biggest. I went into it with the innocent enthusiasm of my 21 years, looking forward to the freedom from home, the glamour of a foreign assignment and the lure of the unknown. Four months later, the Trial over, I left: ten years older, a great deal wiser, and, indeed, an interpreter. En-route, I got lost near Frankfurt in a muddle of travel vouchers, curfews and non-existent trains. When I did reach Nuremberg, I was billeted at the Grand Hotel where I was allowed to remain for the duration. I spent a week in the public gallery listening to the proceedings in the Court Room. Then, after a brief test in the booth during a lunch-break, I was told I would be starting in earnest the following day. I felt it was a matter of sink or swim. I swam. The lay-out of the Court Room was simple and compact. The accused faced the judges, with assorted German counsel and court reporters in between. Our four booths were at right angles and in very close proximity to the defendants. We could watch them and they often watched us. Facing the interpreters were three sets of Prosecution tables which made up the fourth side of the Court, with the Press and public beyond. By today's sophisticated technical standards, the booths and the equipment were primitive. We sat in three-sided glass boxes open at the top (photo below). Because of the tight fit, it was impossible to leave the booths except during breaks when we would shuffle out in reverse order to the way we had shuffled in. The earphones were clumsy things and each booth of three interpreters had to share one hand-held microphone which was passed to whoever was working from the language just being spoken. The system broke down quite frequently and the sound could be bad, but we learned to improvise. Looking back, I am amazed how well we coped and how quickly we acquired the new skills. One of the things we learnt to do fast and well was sight-reading. By the time I got to Nuremberg, it was usual for untranslated prepared speeches to be given to us in writing, which was enormously helpful. Any misgivings I had about my ability to meet the challenge would vanish as soon as I walked into the booth, much like an actor shedding stage-fright when setting foot on the boards. The monitors would keep a constant close watch on our performance and would tell us where we went wrong or how to improve our delivery. I was told to pitch my voice lower, which I did. Ever since, I have been much aware of the quality of an interpreter's voice and wonder why our occasional screech-owls or excessive regional accents have not been brought to task. We worked two days in a row and had the third day off. One team was on for 1 1/2 hours in the morning and again for 1 1/2 hours in the afternoon. While a second team took over for the other half of the morning and afternoon, we would sit in a nearby room which was equipped with ear-phones and where we could follow the proceedings in the Court. There it was that I listened to Lord Justice Lawrence handing down the sentences. The room was packed then, the atmosphere quite as tense and as solemn as in the Court Room itself. The interpreters were, I think, quite a pleasant cosmopolitan lot; a mixture of ages and nationalities, professions and opinions - including several refugees and Jews. Living amidst a sullen native population, in a town that was just a heap of rubble, was stressful, as indeed was the never-ending recital of horrors in the Court Room. I learnt to ignore the first and overcame the strain in Court by concentrating on the work itself. I was greatly helped in this by the remarkable team spirit among the interpreters and by the close and, as it turned out, life-long friendship with some of them. We let off steam dancing the night away in the Marble Room of the Grand Hotel. We had a lot of fun, an indispensable antidote to the Court Room blues. In Court, whatever our private thoughts, it was necessary to remain neutral when working. From being a blur of concentrated human malice the defendants, little by little, emerged as individuals. One could even admire Goering for his intelligence and dignity and share his open contempt for the slimy Streicher. Kaltenbrunner scared me, he was so palpably evil. The closing speech Hess made left me in no doubt that he was completely mad. We all liked Fritzsche who was only there as a substitute for his dead master Goebbels, and we were glad he was acquitted. After the verdicts and the ensuing release of tension, I had had enough of Nuremberg. Whereas I had been working from French into English at the Main Trial, I was supposed to transfer to the German booth for the Subsequent Proceedings. I was rescued by the Chief Interpreter of UNESCO who selected me, along with a few others, to work at the First General Conference in Paris (English/French consecutive). I was released from my Nuremberg contract and left. I returned to Nuremberg recently. The town has been rebuilt, the scars of war no longer visible. The Court Room, after 54 years, seems smaller. A wall now partitions it where the front of the public gallery had been. The large dock has been rebuilt for fewer defendants. The oppressive dark wood panelling and heavy marble door frames remain, though, as does the small lift door at the back of the dock through which the Nazi leaders were daily brought to account. But I had no feeling of past personal involvement. The Nuremberg Trial had become history. Patricia Vander Elst (formerly Patricia Jordan) is a Brussels-based active member of AIIC. She wrote this text in December 2000. Patricia VANDER ELST. "The Nuremberg trial". aiic.net December 18, 2002. Accessed April 21, 2019. <http://aiic.net/p/983>. My father, William Heermann, worked as an interpreter during the Nuremberg trials, having been drafted into the US Army. He was a native German speaker, arriving in the US from Germany at the age of 16. I would like to receive any information about translators / interpreters at the Nuremberg trial: participants, photos, stories, etc. While stationed in Wiesbaden, Germany '86--89, I completed my Master's Degree in International Relations with Troy State University (now Troy University). Two classes I took wer taught by Dr. Ilse Dronberger. In 1971 she published "The Political Thoughts of Max Weber." She told us she was an interpreter at the Nuremburg War Trials (however, now some 24+ yrs, I must admit I don't know what capacity; she may have been a translator. I know that she sat in on many interviews, including Hess and Speer. She had a collection of priceless film she showed in class. Let me know if this might help you in any way. I have a feeling that in the photo of the interpreters, she could be in the front row, second from the left. I would be grateful if the author of this article could email me to confirm or infirm my impression with regard to my mother and that photo. I am trying to find a list of all the interpreters at the Nuremberg War Trials. Hi- I love to read about the history of conference interpretation and have read several academic articles on it, but what was so nice about yours was an "insider's view", your personal feelings before, during and after ... thanks for helping us to better understand this important moment in the history of conference interpretation! In 1973, as a very new and very young conference interpreter in Brussels, I met a number of older freelance colleagues in the English booth, of varying degrees of professionalism and eccentricity. Pat Vander Elst seemed to be perfectly normal, and was certainly an outstanding interpreter - very much someone to emulate. 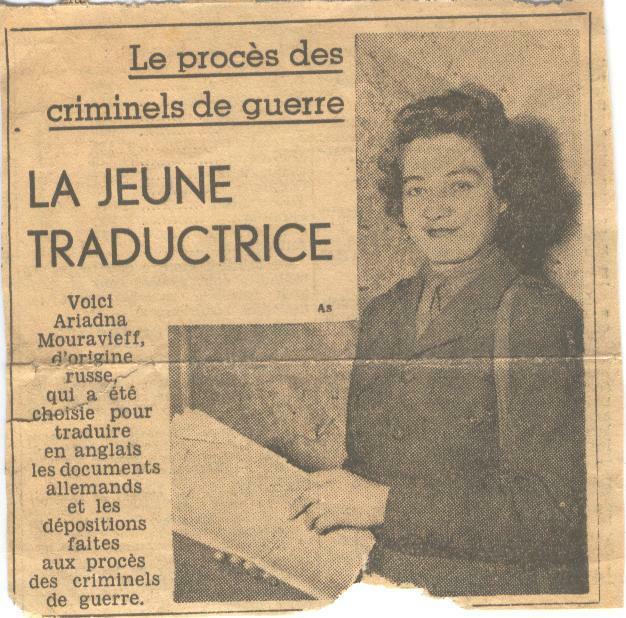 It was only years later, when I began to look at interpreting at war crimes trials as part of my research into court interpreting, that I realized that "my" Pat Vander Elst went all the way back to Nuremberg, "where it all began". The revelation was stunning. Somebody who had been at that historic event was still working, still sane, and "still able to do it." Ours is indeed a very young profession, and some people who were in "at the beginning" are still around, hale and hearty and full command of their marbles. Let us all hope that we will be in as good shape as Pat when we reach a similar stage in life! Pat - I salute you. ...history which you have so keenly made palpably human (whith a touch of humour,I might add, which non-professionals sometimes fail to understand)to those of us who came into the profession after you, hoping not to be found too wanting. Big shoes to fill...!Sincere thanks!